In simple terms Agenda 21/Sustainable Development is the end of civilization as we know it. It is the end of private property, the elevation of the collective over the individual. It is the redistribution of America’s wealth to the global elite, it is the end of the Great American Experiment and the Constitution. And, it is the reduction of 85% of the world’s population. “The concept of national sovereignty has been an immutable, indeed sacred, principle of international relations. It is a principle which will yield only slowly and reluctantly to the new imperatives of global environmental cooperation. If this is true, then he and his cohorts must be even more against individual sovereignty. Keep this quote in mind as you read about Agenda 21. George H.W. Bush was in Rio for the ceremonies and graciously signed on for America so that our Congress did not have to spend the time reviewing the treaty and learning then what dastardly deeds were in store for us - that protecting the environment would be used as the basis for controlling all human activity and redistributing our wealth. In actuality, Sustainable Development is not sustainable unless the population actually is reduced by the 85% called for by the globalists. 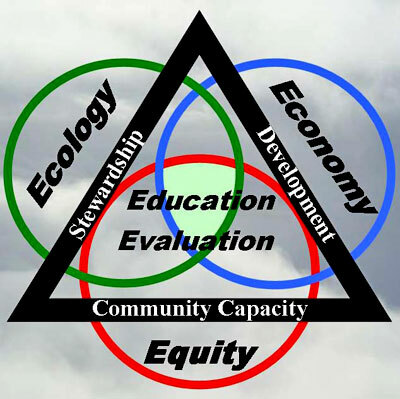 The true purpose of Sustainable Development and all of its policies is the control of all aspects of human life - economic, social and environmental (see 3 Es of Sustainable Development further below). If one were to research the source of U.S. policy, one would find that much of our policy of the last few decades is the outcome of agreements we have entered into via treaties with the U.N. And that policy has trickled, no gushed, down into every state and into almost every other jurisdiction - county, city, town - in the nation; Sustainable Development is the official policy of our country even though many citizens are yet ignorant of its existence. And this policy encompasses an entire economic and social agenda. These Es together encompass every aspect of human life. Social Equity is based on a demand for “social justice.” - in non-Newspeak, redistribution of the wealth. Equity is a system of “social justice” that works to abolish the American concept of equal justice in order to pursue the globalist ideal of the “common good.” Individuals rights must be abolished for the good of the collective, just as in Communism; in fact, Karl Marx was the first person to use the term social justice. Social justice is an unnatural leveling of all wealth (other than that of the global elites); no one person is supposed to profit more than another. Economic growth is often seen as essential for economic prosperity, and indeed is one of the factors that is used as a measure of prosperity. The Rocky Mountain Institute has put forth an alternative point of view, that prosperity does not require growth, claiming instead that many of the problems facing communities are actually a result of growth, and that sustainable development requires abandoning the idea that growth is required for prosperity. The debate over whether economic growth is necessary for, or at odds with, human prosperity, has been active at least since the publication of Our Common Future in 1987, and has been pointed to as reflecting two opposing worldviews. These public/private partnerships are nothing more than government sanctioned monopolies - Mussolini style economics. This mixture of socialism, fascism and corporatism (as Tom DeWeese so aptly pegs it), called Agenda 21, is the ruling force in our government today from the federal to the local. Not one of those ingredients would be allowed by our forefathers and not one is in sync with the Constitution; so how have we allowed all three to be combined into a recipe for global government and served to our unwitting nation? In part I above, I gave you the first half of the overview of Agenda 21. This is part 2 of the overview. Keep in mind that it is just an overview; I will expound upon the key aspects in later articles. “The fact is, Agenda 21 is a blueprint to completely change our society to a top-down planned central economy in a strange mixture of Socialism, fascism and corporatism. The next order of business for the globalist was to convince the general public that the fate of the world was at stake, that we had to do something right now and that “something” would require us to not only give up our standard of living but would have us give up our basic freedoms. In the past we were hit with everything from a new ice age to global food shortages and starvation. But those dire threats didn’t pan out; not enough people were willing to swallow the Kool Aid yet. But all those New Age forecasters were not ready to give up on scaring the bejesus out of us. How else would they achieve their ends? And what did they come up with? A biggie. Environmental Armageddon. Stop everything you are doing and the world might be able to correct itself; go on using natural resources and we doom not only ourselves but the entire rest of the world. Put on your hair shirt, get rid of your middle class home and become one with the earth, i.e., throw out God and turn to Gaia worship and then maybe, just maybe, the globalists can steer us into a safe harbor of post-carbon existence. They claim any talk to the contrary is just the claptrap of right wing radical conspiracy theorists; they figure if they tell this lie often enough, as Nazi Joseph Goebbels said, people will believe it and drink the Kool Aid. “...a progressive transformation of the economy and society (p.43),... international interdependence (p. 47),... redistribution of wealth (p.50),... less material and more equitable growth (p.50-52),... ensuring a sustainable level of population (p.55),... merging environment and economics in decision making (p.62),... and a new ethics that will include the relationship between man and nature above all (p.71). In government it’s called stakeholder councils and non-elected boards and regional government - or reinvented government. The Wildlands Project literally calls for the “re-wilding” of 50% of all the land in every state - back to the way it was before Christopher Columbus set foot on this land. In order to re-wild America, the people must go somewhere else. That was Maurice Strong basically praising Foreman’s folly at the Earth Summit. According to the Wildlands map, certain areas have been designated as human habitat areas; those are the larger cities of our country. You might want to look human habitat areas this way: it is rather like at a zoo. Creatures are penned and other creatures are free to roam and look at the penned creatures; this time it will be humans in the pens and the animals having the run of the country. 1. Simon, Julian, The Ultimate Resource, Princeton University Press, 1981. p. 45. When public policy is made by elected officials who are accountable to the people who are governed, then government is truly empowered by the consent of the governed. Sustainable development has designed a process through which public policy is designed by professionals and bureaucrats, and implemented administratively, with only symbolic, if any, participation by elected officials. The professionals and bureaucrats who actually make the policies are not accountable to the people who are governed by them. The third path to Sustainable Development, is Public/Private Partnerships. PPPs are business ventures that are undertaken with a partnership between the government (public sector) and private business entities. The businesses promise the government that they will operate under the laws of sustainable development and the government then acts as a bullying big brother to the businesses and forces onerous rules and regulations on those who won’t play the PPP game; this tactic often results in putting the competition out of business while the PPPs get more powerful - thanks to Congress. We are bombarded constantly by the PPPs messages of going “green” with their products from toilets (that often take several flushes thus negating their claim to use less water) to wind power, to building materials. Are all of these products really better for us and the environment? What about the new, green light bulbs? GE used their partnership with government to ban their own product - the incandescent light bulb and replace it with the new “green” bulbs. Soon we won’t be allowed to buy incandescent bulbs. Why? Because GE can make three times as much from the new ones as they are more expensive. But they are less green than fuel oil. They come with instructions on how to deal with them if they break - don’t touch with your hands, you could absorb some of the mercury; don’t vacuum, the mercury vapor could be released into the air and you or your children could breathe it causing great harm, etc. It is a miracle they don’t require wearing a Hazmat suit when cleaning one up. Nevertheless they are considered “green” because the government decreed them to be because their manufacturer is a PPP and thus only produces “green” items. And now there is a new kind of corporation being developed through Public Private Partnerships - it’s called “benefit” corporations. “imagine a legislated brotherhood of business where favored businesses get to go to the front of the line for permits, licenses and opportunities merely because they agree to advance the principles of Sustainable Development and Agenda 21. The fourth path to Sustainable Development is called Stakeholder Councils. In our local governments - city and county - an unelected, self-selected group of people are steadily taking over the control of planning and then running the government. Who are these unelected people? First there are the employees of the NGOs (Non-governmental organizations affiliated with the UN) that were working on a visioning plan or another regional planning scheme in the area (see regionalism coming in subsequent article). The Council usually will be composed of several of these NGO workers and one or two globalist-leaning, leading members of the community. How do these Councils take control? They usually come into town to help run the process of a “visioning” plan link or other program designed to regionalize the area. Once they have completed the plan, if they like that area of the country, they stick around to take over and become unelected officials who have no allegiance to the community and no accountability to the electorate while the locally elected, and thus legitimate, office holders are reduced to being rubber stamps for the Council’s decrees. There will not be just one Stakeholder Council, there will be numerous ones, all overlapping other Stakeholder Councils (again see regionalism in subsequent article). The best way I can describe this is like when you make something out of paper mache, you overlap a piece on top of another and another until you have completed your piece of art. In this case it is not art but totalitarian control of the country. Each of these Councils will be autonomous in their sphere. And none of them will be beholding to the citizenry. Let me give you an example from here in Knoxville. We are being “sold” on planET (plan East Tennessee), also called Five Counties, One Vision. The areas of our lives that will be controlled by this stakeholder council will be transportation, housing, economic development/jobs, environment and community health. Think about it, a group of people who have very different views on what is needed vis a vis these areas of our lives is going to be controlling every aspect of housing, the environment and transportation. Those are necessary factors in jobs for the future in America; if a job doesn’t fit all those qualifications then it must be phased out. And let me tell you what they mean by community health. Have you heard of Gross National Happiness? No? Well you better learn about it now, it is going to replace Gross Domestic Product (GDP) as the measurement of our national well-being. I said replace not complement. By now you should be able to figure out what most of that Newspeak means to us normal people. Equitable and sustainable socio-economic development means to take us back from industrialized society to a meaner, more primitive one thus we are all poor together struggling with survival. You can bet the cultural values being promoted are not those of Western Culture and Judeo-Christian values. The so-called conservation of the natural environment is actually the preservation of pre-Columbian environment and the establishment of good governance is global government. This is a lot to grasp, but you must realize that it is but a drop in the bucket of what is being done under the guise of protecting the environment. As I put it at the beginning of this piece, back in part One, Agenda 21/Sustainable Development is the end of civilization as we know it. It is the end of private property, the elevation of the collective over the individual. It is the redistribution of America’s wealth to the global elite, it is the end of the Great American Experiment and the Constitution. There are a lot more aspects that you need to understand. But most importantly, we - every American who loves his or her country and the republic formed by the most incredible forefathers the world has ever known - must fight this with everything we have. There are so many of us and we have reason, right, sound science and the glory of Western Culture and our Judeo-Christian heritage behind us. This is the end of the overview of Agenda 21, the end of Western Civilization or a wake-up call. The next part will cover ICLEI, the APA and the other means of achieving the goals set out in the Agenda.